GluN2C / GluN2D subunit selective NMDA receptor positive allosteric modulator. Causes two-fold increase in receptor channel opening frequency (EC50 values are 2.7 and 2.8 µM for GluN2C and GluN2D respectively). Reduces associated behaviours in schizophrenia models and potentially enhances dopamine release in Parkinson's disease models. GluN2C/GluN2D subunit-selective NMDA receptor potentiator CIQ reverses MK-801-induced impairment in prepulse inhibition and working memory in Y-maze test in mice. Suryavanshi PS et al (2014) Br J Pharmacol 171(3) : 799-809. Allosteric modulation of GluN2C/GluN2D-containing NMDA receptors bidirectionally modulates dopamine release: implication for Parkinson's disease. Zhang X et al (2014) Br J Pharmacol 171(16) : 3938-45. 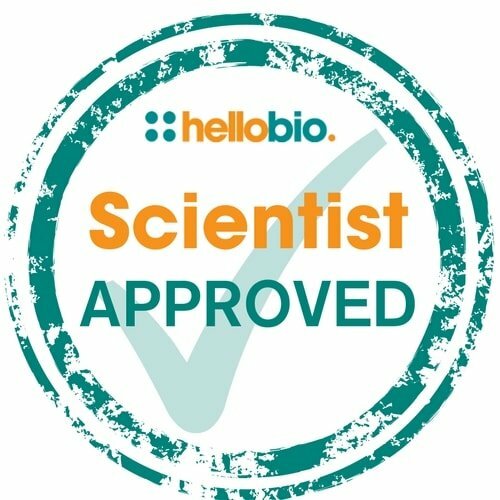 The following papers have cited the use of CIQ (HB0197) from Hello Bio. If you have published a paper using this product, and it is not shown here, then please tell us! We will send you a free gift as a thank you! The NMDA receptor intracellular C-terminal domains reciprocally interact with allosteric modulators. We were happy with the CIQ indeed.